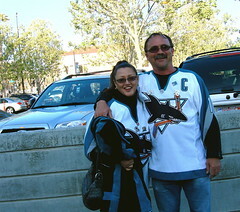 The San Jose Sharks will be hosting a pre-game street rally today Monday April 30th. the rally will be located next to HP Pavilion on Autumn St. between Santa Clara St. and St. John St. Hours of the rally will be from 4:45 to 6:45pm. The event will include a live DJ from Sound in Motion, face painting, poster making, a BMX bike stunt team, and more. Also if you find yourself short on Sharks playoff gear, there will be a booth selling Sharks merchandise to get your wardrobe up to speed. Aramark Playoff Grill will offer FREE ice cream and that’s just what we need as the temp’s rise! All proceeds from the sale of beer during the rally will go to The Sharks Foundation…..so drink up! The Tied House will also host a special Wing eating contest (get it? “Detroit Red Wings”!!!). Ten contestants will have five minutes to eat as many wings as they can….sounds like fun! For more info check the Shark’s website. Or a more direct link to the event page here. My first time to the Silicon Valley was at the very end of 2005. I was visiting friends and sight-seeing, traveling all the way from San Diego to Berkeley. The Bay Area as a whole was gloomy, in a rainy period. I guess the only taste of ‘silicon’ I got was a glimpse of the Intel headquarters (which I now know is in Mission College Boulevard) and a couple of tall buildings which housed Sun and McAfee. Apart from that, I met up with a set of college buddies at Saravana Bhavan (a favourite chain back home) in Sunnyvale. Nothing spectacular overall. However, in February of this year, I moved right into the Valley. [Coincidentally, the San José Metblog was launched just days after I landed.] Within a few weeks, I could feel the buzz that was being generated by all the computer companies around. It was enchanting to realize that I was now in a region which gave birth to many an innovation that has changed the world forever. Of course, I’m slowly figuring out that there’s much more here. Okayama, Japan. The sister city to San Jose. Hoping to give a more “News-reporter style” post as suggested in a comment from “Randramble”, I’ll try to offer up a tiny bit more information. The 50th anniversary celebration of the Sister City affiliation between Okayama, Japan, and San Jose CA I spoke of in my first post started yesterday April 27th and ends Monday April 30th. The itinerary for the event is too long to list here, but you can get the full details in the link below.. As far as the point of all this, simple put it’s the pairing of two cities in different parts of the world with the hopes of bringing people together. These people may have different views, cultures, and lifestyles but may also share similarities in other ways. It’s all about getting to know one another….face to face. For San Jose and Okayama, Japan, it started back in 1956. To learn more, check out the following websites. MarketWire.com: With a complete itinerary of the celebration taking place here in San Jose. The Official San Jose CA website: Get a full break-down on the San Jose Sister City Program. Sister-cities.org: Offers a full list of cities in California with sister city programs as well as nation-wide. Hey Randramble, you were right, I was short on the info….thanks for the push! Norman Y. Mineta San Jose International Airport got a little visit from Japan Airlines today. It was a one-time charter flight from Okayama Japan to San Jose CA. Aboard were around 300 or so Japanese citizens who are here for a 50th anniversary celebration of the sister-city relationship which should last about 4 days. The landing reminded me of the good old days back when American Airlines’s ran the Narita Japan (NRT) flight which was canceled after 15 years of service. The arrival of the Boeing 747 was a welcome sight for all of the employees who lined the ramp to watch the landing. San Jose’s runways (30Right, and 30Left) are only 11,000 feet long with high density automobile traffic at either end, so speculation about the aircraft’s ability to land safely was all the buzz in the final moments before the 747’s touch-down. After handling the DC10, DC10-30, MD11, and 777 I had no worries of my own about the abilities of the aircraft, runway, or pilots……touchdown was as smooth as butter. If I offer my best guess, I would say their were at least 80 people involved in handling this single Japan Airlines flight. It was great to see all of the airport tenants come together under the shadow of construction on the NEW terminal B to make this one flight happen, the operation went off without a hitch. Good time was had by all! Maybe in the future we might see another Tokyo flight operating a few times a week out of San Jose, but for now all we can do it wait, and hope. The Japanese Friendship Garden located in Kelley Park is a great place to take an easy stroll, feed ducks and fish, and take in the beautiful surroundings. The garden is modeled after Korakuen Garden in one of San Jose’s sister cities Okayama, Japan. There are three ponds stocked with Koi fish that gets the most attention. Bring your quarters, as there are at least two fish food dispensers. It was fun watching the kids feeding the ducks and Koi. From the entrance of the park you come upon the upper pond, going to your left there is a there is a beautiful, tranquil area. Unfortunately, it is next to Senter Road and passing trucks and buses soon disrupts your tranquility. The sounds of the road are soon replaced by the sound of the stream that connects to the lower elevation ponds. Nearby is a traditional Japanese teahouse, not open. Along with the pathways, ponds, and streams there are fountains, a waterfall, rock settings, bridges, shrubs and various types of trees. Not on par with the Hakone Gardens, I still highly recommend a visit to the Japanese Friendship Garden. There are only benches, no picnic tables; however there are picnic tables outside the gardens, including tables “next door” at History San Jose. The garden is open daily 10:00am to sundown. Admission is free. Parking is $6.00 weekends and most weekdays. Parking info via Happy Hollow Park here (PDF). Silicon Valley is the perfect environment for students to explore engineering. Saturday April 28, they will gather at The Tech Museum’s 20th Annual Tech Challenge to show off their skills. Many of the enthusiastic students show up wearing colorful team costumes making The Tech Challenge a fun family outing, and this year it is all about Mars. with a padded drop zone and a textured crater wall and crater rim. An improvised and nervously spontaneous introduction! “You never get a second chance to make a first impression.”, I’ll try not to blow it. Hello everyone, My name is Dred242. Well, that’s not my birth name, just an online identity I’ve had and used for the past 8-10 years…..greetings! I would first like to thank Joann, Sean, Gary, and Jason for getting me all set up to join, and participate here at Metroblogging San Jose….thanks again. The content I’ll offer up to everyone will be a collection of observations on things in, and around San Jose CA. Everyone has an opinion, right? So with that being said, I would love the chance to offer my take on local events, government issues, business, and people that may otherwise go un-noticed. Now, if I can pull this off on a regular basis, then I’ll consider this my greatest contribution to the Web since “Google”! Ok, google is pretty big, how about “YouTube”? Still too big, how about “Web 2.0”? I have lived in San Jose next to forever and in that time, I have never visited Kelley Park. It was a beautiful day, so time to get outside and explore, off to History San Jose. When you come into the park, you are looking down a long and wide main street. My first impression was that there is plenty of room to add buildings. History San Jose is a collection of homes and businesses from various periods of the valley’s past. The homes depict the various styles of architecture from the 1800’s through early 1900’s. There are reconstructions of various buildings including The Bank of Italy (BofA), Pacific Hotel, Dashaway Stables, and the Electric Light Tower. The Electric Light Tower was a 237-foot tower that provided light to downtown San Jose in the late 1800’s. One building I wanted to go inside and check out was the Trolley Barn. I looked in the window and saw a horse drawn streetcar, trolley cars, and assorted antique cars. A few of the buildings are open on the weekends. The museum store and O’Brien’s Café are open Tuesday through Sunday. There are many more buildings including the Ng Shing Gung; built in 1888 to serve as a cultural and religious center for San Jose’s Chinese community. You will find numerous picnic tables throughout the park. The park is open Tuesday through Sunday 12noon to 5:00pm. Admission is free *. Parking is $6.00 weekends and most weekdays. It looks as though the City of San José is not doing anything special for Earth Day. Speak up if you know of an event in the area. Check Out – Pacific Gas and Electric Company. The Nashville Predators score 1 Jason Arnott. Cheechoo* gets temporary credit for goal 3.